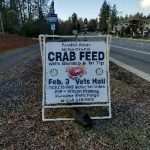 Crabfeed signs are up with help of Tom Baker, President Elect Nominee and Friend, Tickets are on sale now, don’t miss out on the best party on the Ridge. Paradise Rotary donates thousands each year to our community and world through fundraisers like this. This year we donated $25,000 to the Gold Nugget Museum to enhance the newly named Yellowstone Kelly Historic Trailway. This just one of the numerous projects the club has partnered with the Museum to accomplish over the years including the restoration of the Caboose at the Historic Train Depot. Come and enjoy the fun and fellowship on Feb 3rd while helping our community be a better place to live. Tickets are available at Pip Printing, A Stitch Above Embroidery, Wells Fargo Bank (Paradise) or any Paradise Rotarian.